EEEEEK! I got these cookie cutters in the mail and I just couldn't wait to use them. For those of you who don't know, I am a chemist. Or was a chemist. Or sometimes am a chemist? I work for a lab, how about that? I am technically a project manager at an environmental lab. So, I only spend a handful of days working in the lab each year. However, I started working in the lab and have worked with my fair share of glassware. 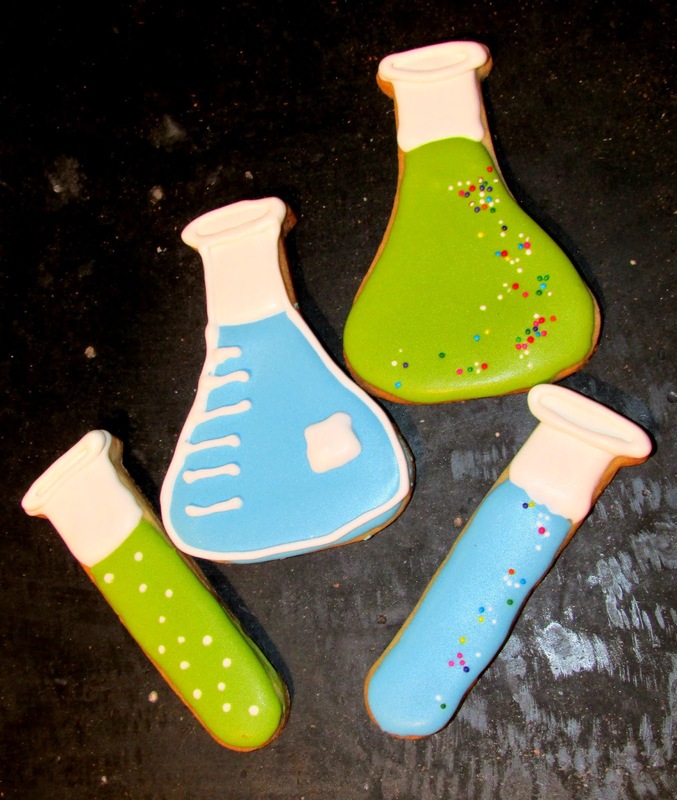 So, the nerd in me was so excited to get these cutters and I couldn't wait to make cookies for the lab! This is a great recipe for making cookies when you don't plan it out ahead of time. There is no need to soften the butter and no chilling the dough for a few hours before you roll it. As you know by now, patience is not my specialty... especially when I get really excited about something. So I had to go right to work! This recipe also worked great for today, because it is a little smaller than my go-to sugar cookie recipe. I didn't need to swim in nerdy cookies... I just needed enough to show off my new cutters and bring a treat to the lab. These are great cookies for decorating. They are sturdy and don't rise or spread much. So you can do your fancy decorating. I don't get too fancy, but I do have fun doing simple icing... and my consistency isn't always perfect, so a flat cookie is nice! In mixer, cream together butter, sugar and salt. When smooth and fluffy, add the egg and extract. Mix until smooth. Slowly add flour mix to butter mix until incorporated. The dough will be slightly crumbly, but you should be able to bring it together with your hands. Place dough on floured surface and roll to about a 1/4" thick. Cut into desired shapes and place onto baking sheets. If you want really crisp edges, place in the freezer for 5 minutes. If you don't care, go ahead and bake! These are so adorable! 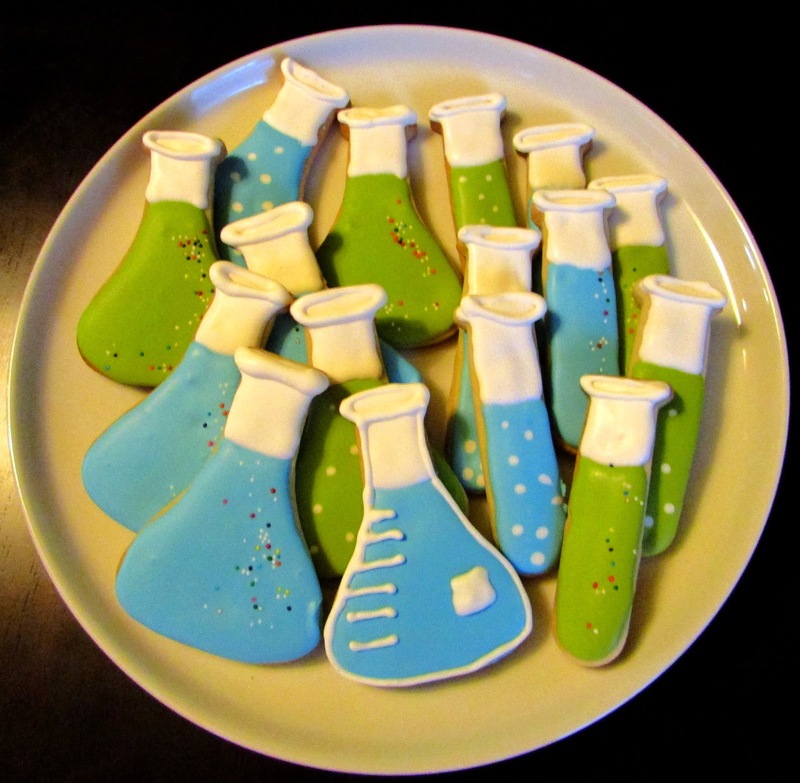 My ten year old wants a mad scientist party this year and these would be great! I found you on Project Parade Linky party! Pinning! Thank you! I think they were my favorite cookies to decorate! So easy and so fun! Haha Those are such cute cookies! My kids love sugar cookies, but mine never come out in cool shapes. They turn out as blobs. They still like to eat them though. This recipe holds its shape really well. Though I am sure the blobs still taste really good! Oh how cute!!!! Beautiful cookies! Thank you, they were a lot of fun to make! Thank you so much! They were a lot of fun to make. These are such cuties! They really turned out adorable! I would love if you would share this at "Celebrate It!" blog party! It's all about how we celebrate the everyday moments of life! I hope you will stop by! Those are awesome cookies! I like that you don't have to chill the cookie dough! Thank you, they are perfect for decorating! I'm loving these cookies! Nice set of Erlenmeyers and test tubes. :) I hope you can stop on by and share this or any other recipe with us on Five Friday Finds! These are so cute! I love the science theme. I really appreciate you linking up with us at Talented Tuesday. This post and you banana cake were a tie for our most clicked link last week! I hope you can join us again tomorrow. Your recipe for sugar cookies looks great, sugar cookies can be so much fun! Hope you are having a great week and thanks so much for sharing your post with Full Plate Thursday. They were fun to make. Thank you for hosting! These are adorable! I love the sprinkles! Thank you! I thought they turned out pretty cute and they were easy to decorate!